Navy SEALs Team 6  and its dog  which carried out the operation against Osama bin Laden, is getting a lot of attention. And while its latest mission is indeed praiseworthy, these special operations forces are among the best-trained troops in the world and have been pulling off death-defying, badass missions since the 1960s. The SEALs  the abbreviation stands for "Sea, Air and Land"  were created in 1961 as President John F. Kennedy recognized the need for unconventional warfare in the escalating conflict in Vietnam. 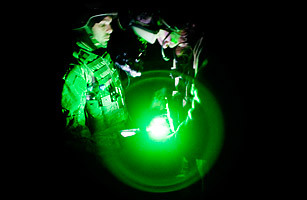 Not long after, Seal teams began operating in the Southeast Asian nation. Among their ranks was U.S. Senator Bob Kerrey of Nebraska, who served as a SEAL in Vietnam from 1966 to 1969. He was awarded a Purple Heart, a Bronze Star and the Medal of Honor for his service. SEALs have operated in every major conflict arena since, including the Persian Gulf, Bosnia, Afghanistan and Iraq, as well as strategic operations in Grenada and Panama. The same team that killed bin Laden was also involved in the successful recapture of a ship held by Somali pirates in April 2009. See photos of Navy Seals in action.